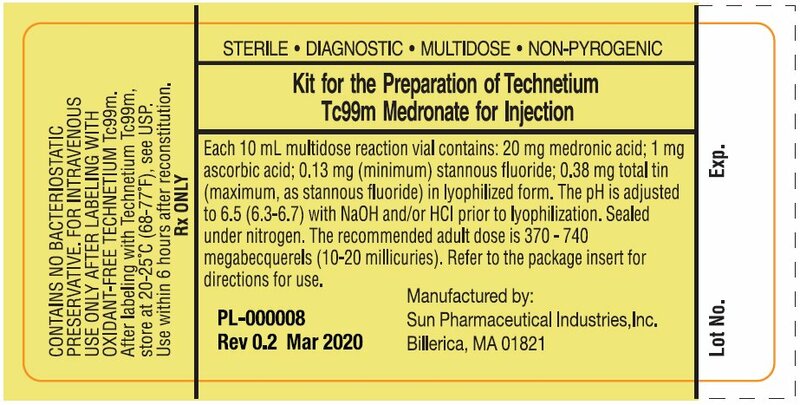 Kit for the Preparation of Technetium Tc 99m Medronate is a multidose reaction vial which contains the sterile, non-pyrogenic, non-radioactive ingredients necessary to produce Technetium Tc 99m Medronate Injection for diagnostic use by Intravenous injection. When a solution of sterile, non-pyrogenic, oxidant-free Sodium Pertechnetate Tc 99m Injection is added to the vial, the diagnostic agent, Technetium Tc 99m Medronate is formed for administration by intravenous injection. The pH of the reconstituted product is 5.4 to 6.8. The precise structure of Technetium Tc 99m Medronate Injection is not known at this time. Technetium Tc 99m decays by isomeric transition with a physical half-life of 6.02 hours1. The principal photon that is useful for detection and imaging studies is listed in Table 1. 1Kocher, DC: Radioactive Decay Data Tables, DOE/TIC-11026, 108, 1981. The specific gamma ray constant for Tc 99m is 0.78 R/millicurie-hr at 1 cm. The first half-value layer is 0.017 cm of lead (Pb). A range of values for the relative attenuation of the radiation emitted by this radionuclide that results from interposition of the various thicknesses of Pb is shown in Table 2. To facilitate control of the radiation exposure from millicurie amounts of this radionuclide, the use of a 0.25 cm thickness of Pb will attenuate the radiation emitted by a factor of about 1,000. During the initial 24 hours following intravenous injection of Technetium Tc 99m Medronate, about 50% of each dose is retained in the skeleton, and about 50% is excreted in the urine. Upon intravenous injection, Technetium Tc 99m Medronate exhibits a specific affinity for areas of altered osteogenesis. In humans, blood levels fall to 4 to 10% of the injected dose by two hours post-injection and to 3 to 5% by three hours. Uptake of Technetium Tc 99m Medronate Injection in bone appears to be related to osteogenic activity and to skeletal blood perfusion. The deposition in the skeleton is bilaterally symmetrical, with increased accumulation in the axial structure as compared to the appendicular skeleton. There is increased activity in the distal aspect on long bones as compared to the diaphyses. Technetium Tc 99m Medronate Injection may be used as a bone imaging agent to delineate areas of altered osteogenesis. This class of compounds is known to complex cations such as calcium. Particular caution should be used with patients who have, or may be predisposed to hypocalcemia (i.e., alkalosis). Preliminary reports indicate impairment of brain scans using Sodium Pertechnetate Tc 99m Injection which have been preceded by a bone scan using an agent containing stannous ions. The impairment may result in false-positive or false-negative brain scans. It is recommended, where feasible, that brain scans precede bone imaging procedures. Alternatively, a brain imaging agent such as Technetium Tc 99m Pentetate Injection may be employed. Contents of the vial are intended only for use in the preparation of Technetium Tc 99m Medronate Injection and are NOT to be administered directly to the patient. Technetium Tc 99m Medronate Injection as well as other radioactive drugs must be handled with care, and appropriate safety measures should be used to minimize radiation exposure to the patient and clinical personnel consistent with proper patient management. To minimize radiation dose to the bladder, the patients should be encouraged to drink fluids and to void immediately before the examination and as often thereafter as possible for the next 4 to 6 hours. Technetium Tc 99m Medronate Injection should be formulated within six (6) hours prior to clinical use. Optimal imaging results are obtained 1 to 4 hours after administration. The finding of an abnormal concentration of radioactivity implies the existence of underlying pathology, but further study is required to distinguish benign from malignant lesions. The image quality may be adversely affected by obesity, old age, or impaired renal function. The components of the kit are sterile and non-pyrogenic. It is essential to follow directions carefully and to adhere to strict aseptic procedures during preparation. Technetium Tc 99m labeling reactions involved depend on maintaining the stannous ion in the reduced state. Hence, Sodium Pertechnetate Tc 99m Injection containing oxidants should not be used. The preparation contains no bacteriostatic preservative. Technetium Tc 99m Medronate Injection should be stored at 20-25ºC (68-77ºF) and discarded 6 hours after reconstitution. The solution should not be used if the contents are cloudy. The components of the Kit for the Preparation of Technetium Tc 99m Medronate for Injection are supplied sterile and non-pyrogenic. Aseptic procedures normally employed in making additions and withdrawals for sterile, non-pyrogenic containers should be used during addition of the pertechnetate solution and the withdrawal of doses for patient administration. Shielding should be utilized when preparing Technetium Tc 99m Medronate Injection. No long-term animal studies have been performed to evaluate carcinogenic potential or whether Technetium Tc 99m Medronate Injection affects fertility in males or females. Mutagenesis studies have not been conducted. Animal reproduction and teratogenicity studies have not been conducted on Technetium Tc 99m Medronate Injection. It is also not known whether Technetium Tc 99m Medronate Injection can cause fetal harm when administered to a pregnant woman or can affect reproductive capacity. Technetium Tc 99m Medronate Injection should be given to a pregnant woman only if clearly needed. Ideally, examinations using radiopharmaceuticals, especially those elective in nature, on a woman of childbearing capability, should be performed during the first few (approximately 10) days following the onset of menses. Technetium Tc 99m Medronate Injection is excreted in human milk during lactation; therefore, formula feeding should be substituted for breast feeding. Safety and effectiveness in pediatric subjects have not been established. Several adverse reactions due to Technetium Tc 99m Medronate Injection have been reported. These were usually hypersensitivity reactions characterized by itching, various skin rashes, hypotension, chills, nausea and vomiting. There have also been rare cases of dizziness and asthenia associated with the use of Technetium Tc 99m Medronate. Shielding should be utilized when preparing Technetium Tc 99m Medronate Injection. • 370-740 megabecquerels: (10-20 millicuries) given intravenously. • Imaging is optimal at 1 to 4 hours post Injection. The effective half-life was assumed to be the physical half-life for all calculated values. The estimated radiation absorbed doses to an average ADULT patient (70 kg) from an intravenous injection of a maximum of 740 megabecquerels (20 millicuries) of Technetium Tc 99m Medronate Injection are shown in Table 4. Kit for the Preparation of Technetium Tc 99m Medronate Injection is supplied in kits of five (5) or thirty (30) sterile, non-pyrogenic vials. Each 10 mL multidose vial contains 20 mg medronic acid, 1 mg ascorbic acid, 0.13 mg minimum stannous fluoride (SnF2) and 0.38 mg maximum total tin, as stannous fluoride, SnF2 in lyophilized form. The pH is adjusted with sodium hydroxide and/or hydrochloric acid prior to lyophilization. The vial does not contain a preservative. The contents of the vial are lyophilized and sealed under nitrogen at the time of manufacture. The pH of the reconstituted product is 5.4 to 6.8. 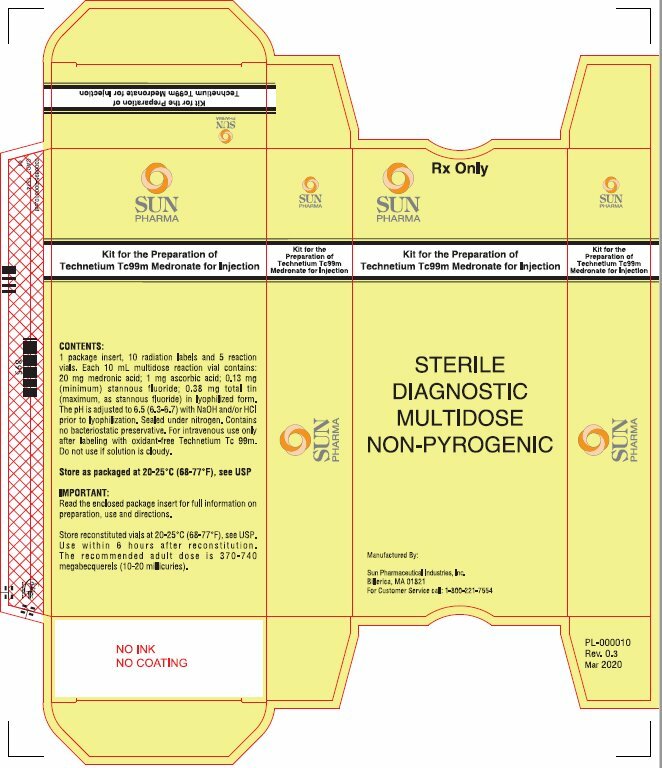 Included in each five (5) vial kit is one (1) package insert and ten (10) radiation labels. 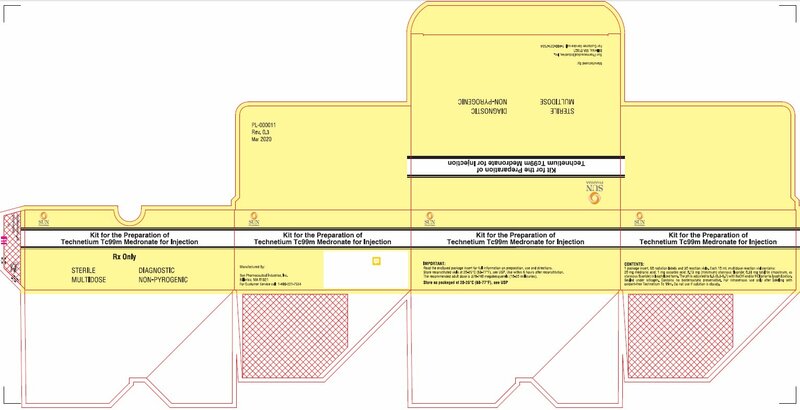 Included in each thirty (30) vial kit is one (1) package insert and sixty (60) radiation labels. Store the product as supplied at 20-25°C (68-77°F) [See USP]. After reconstitution store at 20-25°C (68-77°F) [See USP] (see DOSAGE AND ADMINISTRATION). The lyophilized powder in the reaction vial is sterile and non-pyrogenic and does not contain a preservative. Shielded syringes and aseptic procedures normally employed in making additions and withdrawals from sterile, non-pyrogenic containers should be used during addition of pertechnetate solution to the reaction vial and the withdrawal of doses for patient administration. If sodium pertechnetate Tc 99m must be diluted prior to injection into the reaction vial, only Sodium Chloride Injection USP 0.9% (without preservatives) should be used. • Waterproof gloves should be worn during the preparation procedure. Remove the plastic disk from the vial and swab the top of the vial closure with alcohol to sanitize the surface. • Complete the radiation label and affix to the vial. Place the reaction vial in a suitable radiation shield. • With a sterile, shielded syringe aseptically obtain 0.5-5 mL, of a suitable, oxidant-free, sterile, non-pyrogenic Sodium Pertechnetate Tc 99m Injection containing no more than 18.5 gigabecquerels (500 millicuries). Aseptically add the Sodium Pertechnetate Tc 99m Injection to the vial. Be sure to maintain a nitrogen atmosphere in the vial by not introducing air during reconstitution. • Swirl the contents of the vial for one minute, and let stand for at least 10 minutes. • The radiochemical purity of the prepared radiopharmaceutical should be checked prior to patient administration. • Examine vial contents for particulates and discoloration prior to injection. Do not use if solution is cloudy. • Use within six (6) hours of preparation. For optimum results, this time should be minimized. The vial contains no bacteriostatic preservative. After reconstitution store at 20-25°C (68-77°F) [See USP]. • The patient dose should be measured by a suitable radioactivity calibration system immediately prior to administration. This reagent kit for the preparation of a radiopharmaceutical is approved for use by persons licensed pursuant to Section 120.547, Code of Massachusetts Regulation 105, or under equivalent license of the U.S. Nuclear Regulatory Commission or an Agreement State. Each 10mL multidose reaction vial contains: 20 mg medronic acid; 1 mg ascorbic acid; 0.13mg (minimum) stannous fluoride; 0.38 mg total tin (maximum, as stannous fluoride) in lyophilized form. The pH is adjusted to 6.5 (6.3 - 6.7) with NaOH and/or HCI prior to lyophilization. Sealed under nitrogen. The recommended adult dose is 370 - 740 megabecquerels (10-20 millicuries). Refer to the package insert for directions for use. CONTAINS NO BACTERIOSTATIC PRESERVATIVE. FOR INTRAVENOUS USE ONLY AFTER LABELING WITH OXIDANT-FREE TECHNETIUM Tc99m. After labeling with Technetium Tc99m, store at 20-25°C (68-77°F), see USP. Use within 6 hours after reconstitution. 1 Package insert, 10 radiation labels and 5 reaction vials. Each 10 mL multidose reaction vial contains: 20 mg medronic acid; 1 mg ascorbic acid, 0.13 mg (minimum) stannous fluoride; 0.38 mg total tin (maximum, as stannous fluoride) in lyophilized form. The pH is adjusted to 6.5 (6.3-6.7) with NaOH and/or HCI prior to lyophilization. Sealed under nitrogen. Contains no bacteriostatic preservative. For intravenous use only after labeling with oxidant-free Technetium Tc 99m. Do not use if solution is cloudy. Read the enclosed package insert for full information on preparation, use and directions. Store reconstituted vials at 20-25°C (68-77°F), see USP. Use within 6 hours after reconstitution. The recommended adult dose is 370-740 megabecquerels (10-20 millicuries). 1 Package insert, 60 radiation labels and 30 reaction vials. Each 10 mL multidose reaction vial contains: 20 mg medronic acid; 1 mg ascorbic acid, 0.13 mg (minimum) stannous fluoride; 0.38 mg total tin (maximum, as stannous fluoride) in lyophilized form. The pH is adjusted to 6.5 (6.3-6.7) with NaOH and/or HCI prior to lyophilization. Sealed under nitrogen. Contains no bacteriostatic preservative. For intravenous use only after labeling with oxidant-free Technetium Tc 99m. Do not use if solution is cloudy. Each 10 mL multidose reaction vial contains: 20 mg medronic acid; 1 mg ascorbic acid; 0.13 mg (minimum) stannous fluoride; 0.38 mg total tin (maximum, as stannous fluoride) in lyophilized form. The pH is adjusted to 6.5 (6.3 â€“ 6.7) with NaOH and/or HCl prior to lyophilization. Sealed under nitrogen. Contains no bacteriostatic preservative. For intravenous use only after labeling with oxidant-free Technetium Tc99m. Do not use if solution is cloudy. Store the reconstituted vial at 20-25°C (68-77°F), see USP, after labeling with Techneitum Tc99m. Use within 6 hours after reconstitution. The recommended adult dose is 370 â€“ 740 megabecquerels (10-20 millicuries). Refer to the package insert for directions for use.